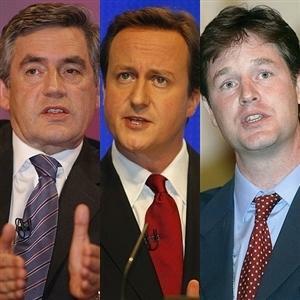 The third and final live TV Election Debate staged at the University of Birmingham with Gordon Brown, David Cameron and Nick Clegg focusing their final arguments towards the topic of Economics. Will there be a Hung Parliament come May 6th or will we see a clear winner? The final debate opened in the swish and bright setting of the University of Birmingham, with podiums set up for the leader’s decisive oratory. After yesterday’s non-news story concerning Gordon Brown’s comments when he called a lifelong Labour supporter “bigoted” in private which was then broadcast unknowingly to national media, Brown seemed nervous, tense and resigned. Newly tanned Nick Clegg seemed initially more confident and spoke more directly than his counterparts and sharp looking David Cameron seemed on form. “The Conservative and Labour governments have created the problems… Get real!” proclaimed Nick Clegg. Brown and Cameron accuse Nick Clegg of being misguided on immigration numbers. Clegg defended his position by speaking about immigration and criminal gangs, but struggled with his point. The slashing of child tax credits as proposed by the Liberal Democrats and the Conservatives was a bone of contention with Gordon Brown and he aimed his attack at both Cameron and Clegg with anger. Nick Clegg’s answers throughout the debate seemed very idealistic, perhaps overly so with regards to some of his policies and Cameron was much calmer in this final showdown. With the claims and counter claims and the political point scoring from each politician it is very difficult to know which politician and party to feel confident in. How can all three appear to know and promise so much? Thursday is fast approaching, and snapshot instant opinion polling of who won this final debate show the Conservatives and Liberal Democrats very close, with Conservative ahead with 35% of the votes. Is David Cameron our next Prime Minister?